The goal of this project, which is based on an agreement between the American and Japanese governments, will be to demonstrate smart grid technologies that will enable the efficient use of renewable energy and will contribute to the implementation of a low-carbon social infrastructure system in island regions. The demonstration site has been designed to respond to the rapidly changing demands in the renewable energy market, which will be made possible through the use of electric vehicles (EV) and other innovative technologies. The demonstration site is scheduled to be in operation from December 17, 2013, through the end of March 2015. Based on the results of analysis and evaluations, the goal of this site is to build a business model for future "Island Smart Grids" that will be built in other sub-tropical regions with environmental conditions similar to Maui. According to Maui Electric Company, in 2012, renewable energy accounted for 21% of the total energy supply on the Hawaiian island of Maui, and current plans call for at least 40% of increased demand for electrical power throughout the entire state of Hawaii to be met with the use of renewable energy by 2030. In the backdrop of the growing adoption of renewable energy, in 2011, NEDO initiated the "Japan-U.S. Island Grid Project" (commonly referred to as the "JUMPSmartMaui" Project) to resolve the issues related to the use of these new energy sources. As the company with primary responsibility for this Project, Hitachi oversees all aspects of Project activities, and has been working on the construction of the demonstration site in collaboration with the Mizuho Bank and the Cyber Defense Institute, along with the state of Hawaii, the County of Maui, Hawaiian Electric Industries, Inc., the University of Hawaii, and the American national research laboratories. In order to create a smart grid for island regions using EV, Hitachi has established an EV Energy Control Center (EVECC), and has already put in place a Distribution Management System (DMS) to control power distribution systems in the Kihei district on the south side of Maui, and the Energy Management System-Plus (EMS-Plus). The goal is to control the balance of supply and demand in electric power systems and support the efficient operations of renewable energy. These systems also incorporate the Direct Load Control (DLC) technology for the direct control of devices in users' homes, which was introduced in order to minimize the effects of fluctuations in the supply of renewable energy. Up until now, Hitachi has involved the public to be part of the demonstration on a volunteer basis and participate in the demonstrations primarily focused on the EV users on the island of Maui. Also, regular residents/consumers interested in participating in control demonstrations for electric water heaters installed in private residences in the Kihei area will also be involved in the demonstration. Hitachi has also promoted the installation of rapid EV charging stations, as well as complying with American cyber security standards, in order to ensure the safety of systems operating throughout the demonstration site and throughout the duration of the demonstration project. To date, Hitachi had already confirmed approximately 150 volunteers as user of EV, and "confirmed" approximately 40 residential households interested in participating in control demonstration using electric water heaters. In order to promote further demonstration, the company plans to "secure" 200 volunteers as EV users and 40 volunteer user households in total. Already, 20 EV charging stands have been installed at five existing rapid EV charging stations, and there are plans to establish a total of 20 charging stations in the future. Today, an opening ceremony was held on the Maui Island to coincide with the launch of the site operations. Attendees at the ceremony included Mr. Hiroshi Kuniyoshi, Executive Director at NEDO; Mr. Koji Tanaka, Executive Vice President and Executive Officer at Hitachi; Mr. Kosuke Nakamura, Managing Executive Officer at Mizuho Bank; and Mr. Makoto Kubota, President of Cyber Defense Institute. Also, Mr. Alan M. Arakawa, Mayor of Maui County, and Ms. Sharon Suzuki, President of Maui Electric Company attended the ceremony. On-site demonstrations will use wind power generation systems and power systems installed on the island of Maui, which generate a total of 72,000 kW of power. These power systems leverage information technologies to demonstrate controls for the power distribution systems and the load on the consumer side, as well as systems for controlling EV operations and charging, including various types of rapid charging devices. Operations at the demonstration site are scheduled to continue until March 2015, and following this period, subsequent studies and discussions will be conducted for implementing new business models based on the results of these demonstrations and evaluations. In November 2009, an agreement was reached during the Japan-U.S. Summit dedicated to the "Japan/U.S. Clean Energy Technology Collaboration," and in June 2010, a "Memorandum of Cooperation (MOC) highlighting the Hawaii-Okinawa Partnership on Clean and Efficient Energy Development and Deployment" was completed by the Japanese Ministry of Economy, Trade and Industry, the U.S. Department of Energy, Okinawa Prefecture, and the State of Hawaii. Upon completion of these agreements, NEDO completed a basic agreement with the State of Hawaii in November 2011, and completed a similar agreement with Maui County in June 2013. Toward the realization of Island Grids that utilize EV for the more efficient use of renewable energy, Hitachi will strive to achieve integrated energy management in this island region, by linking the Distribution Management System in Kihei with the EVECC. Furthermore, EVECC allow volunteers with their PCs and smart phones to monitor the status of EV charging and automatically adjust the timing of charging startup. With this in mind, the Project will also serve to verify mechanisms for efficiently absorbing excess electric power from renewable energy sources into EV. The Distribution Management System installed in Kihei will use the Direct Load Control (DLC) technology to stabilize power distribution systems and minimize the effects of fluctuations in power output resulting from increased ratios of renewable energy by controlling frequency support*1, rechargeable batteries, µ (micro) DMS*2 and consumer devices. 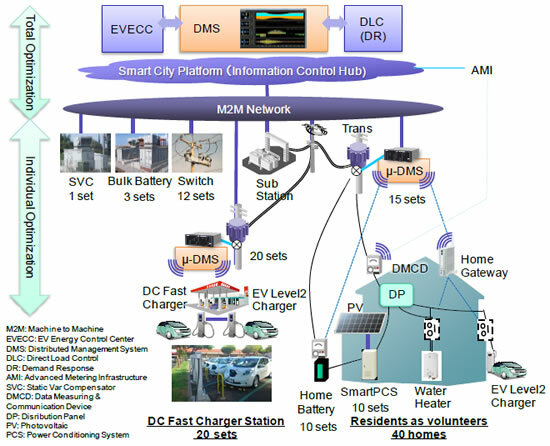 This configuration will also enable autonomous control in the low-voltage systems for distributing power to homes, commercial facilities, and other buildings through µDMS. Additionally, it will make it possible to control photovoltaic output and voltage as well as emergency load, in order to prevent transformer overload. Through this Project,Hitachi will verify the effects on the stabilization of power distribution systems achieved by linking DMS and µDMS and by implementing controls on various levels. At the same time, the Project verifies the optimal energy management strategy for the system as a whole, including Direct Load Control and reduction of frequency fluctuations. Frequency Support Control: Rapid fluctuations in output from wind power generation and other forms of renewable energy are expressed in the form of changes to the frequency of electric power systems. When frequencies appear likely to deviate from specified values, the Distribution Management System reduces frequency fluctuations by isolating non-urgent load and adjusting battery charge and discharge volumes. µDMS: As a low-level DMS installed in low voltage transformers to control entire power distribution systems, µDMS controls household devices using bidirectional communication between the DMS and the low voltage power distribution systems.